If you follow this HOWTO, at the end of it you'll have a 31-bit CENTOS 4.6 running under z/VM. The install can take anywhere from half hour to a couple of hours depending on a couple of things, including your internet connection speed, as well as how much CPU time your VM guest gets. First of all, you'll need to get the installation files to get things going. I used CentOS 4.6 to write this howto, but a newer version should work just as well. Note: If you want a 64-bit system, you'll want to use s390x in the path instead.
. Then transfer the files you got to your A minidisk. You can either use FTP, or IND$FILE through your 3270 terminal emulator. I used the IND$FILE method via c3270. Note: The .img files should be transfered as binaries, and the other two need to be converted to EBCDIC. 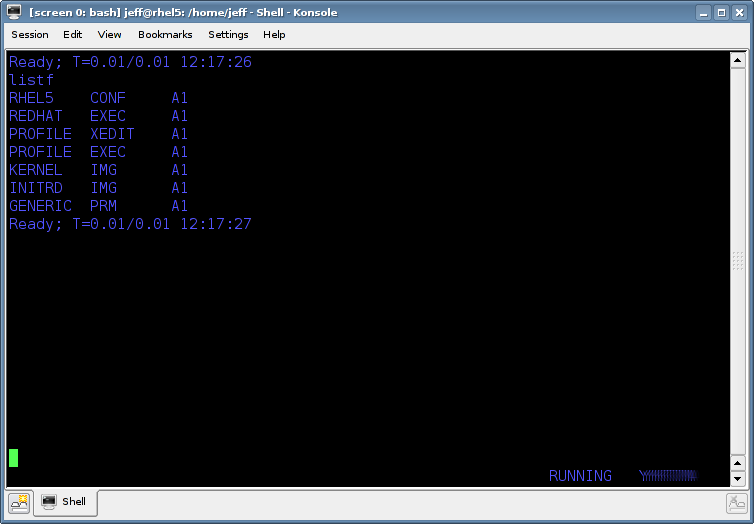 Both, FTP and IND$FILE support converting between ASCII and EBCDIC. transfer host=vm ... mode=binary localfile=kernel.img "hostfile=kernel img a"
transfer host=vm ... mode=binary localfile=initrd.img "hostfile=initrd img a"
transfer host=vm ... mode=ascii localfile=redhat.exec "hostfile=redhat exec a"
transfer host=vm ... mode=ascii localfile=generic.prm "hostfile=generic prm a"
As one might easily guess, the first is the kernel image, and the second is the initrd. The third file is a short REXX script that'll punch the files in the proper order to your rdr, and then IPLs from device 000c - which by convention is your rdr. The last file contains the kernel command line options, which on systems like i386, you specify via a keyboard to the bootloader. You will want to change the DASD to list all your DASDs that Linux should bring online. The HOSTNAME, IPADDR, NETWORK, NETMASK, SEARCHDNS, BROADCAST, GATEWAY, DNS, and MTU need to be changed to match your network config. And chances are that you'll want to change NETTYPE to qeth, or something other than ctc (possible values are: ctc, qeth, iucv, lcs). Go read the CentOS documentation to figure out what are all the options you can use in the config file. Shortly after, you'll see the kernel banner displayed. 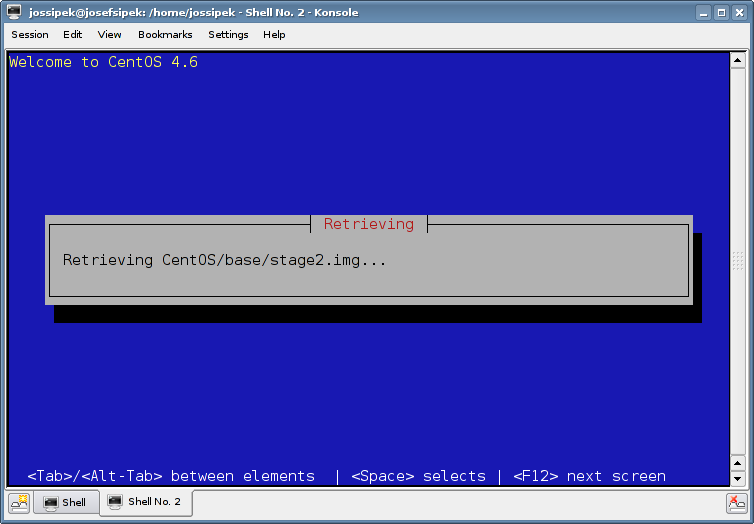 Since I installed CentOS 4.x, the kernel version is 2.6.9. If you use 5.x, the version will be obviously different. 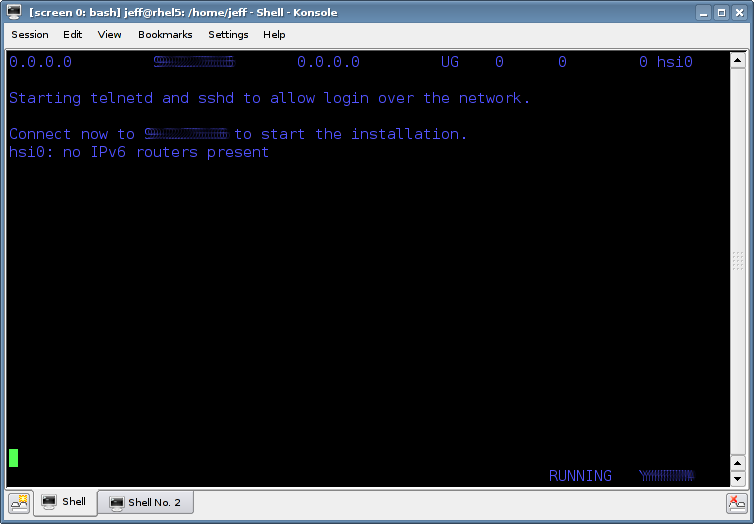 SSH or telnet in as root. The password is the empty string, so when prompted for it, simply press the enter key. At this point, the install process is much like network install on any other architecture. The regular CentOS installer will kick in. It'll prompt you for the type of install (http, ftp, nfs). I went with HTTP. Partition your DASDs whichever way you want. It's a good idea to use LVM, since DASDs are limited to about 2.2GB (3338 cylinders). On my setup, I made /home a logical volume of 5 3390-3 DASDs. installing a 64-bit version should be the same process...just use the s390x directories on the mirror instead of s390. installing RHEL 4.x should be the same process; just grab the right kernel/initrd files, and then point the installer at a server with RHEL4 RPMS. 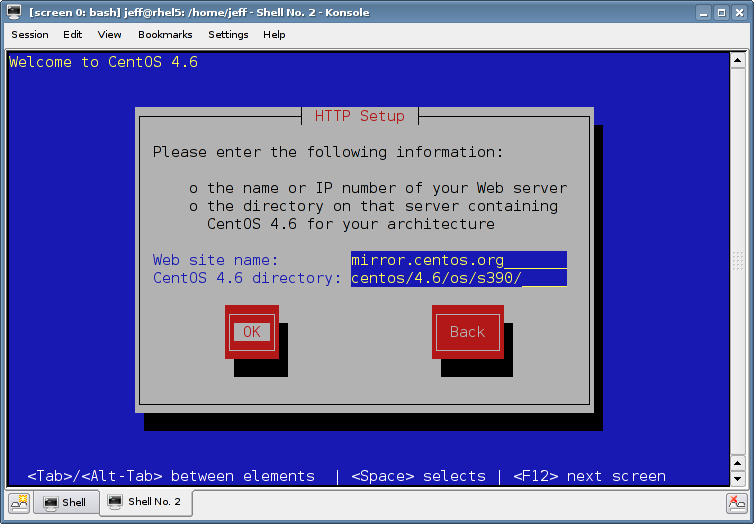 I hope this HOWTO helped you get started with CentOS under z/VM. I tried to be as accurate and specific with the details where I thought it was necessary - the S/390 specific parts. If you have any suggestions, or comments (content, spelling, etc.) feel free to contact me via email: jeffpc@josefsipek.net.